The item Doctor Who, Issue 2, writer, Nick Abadzis ; artist, Elena Casagrande, (electronic resource) represents a specific, individual, material embodiment of a distinct intellectual or artistic creation found in Richland Library. ON THE DAY OF THE DEAD, THE MYSTERY DEEPENS - IN A BRAND-NEW BROOKLYN ADVENTURE FOR THE TENTH DOCTOR! All Gabriella Gonzalez wanted was to skip her shift at the Laundromat and hang out with her friends. It's Halloween, and Sunset Park is hosting its first-ever Day of the Dead festival! But her father wouldn't listen - again - and now Gabby is stuck with a store full of empty washing machines while the rest of the neighborhood goes wild. But this graveyard shift is living up to its name! Vortexes explode out of the machines, shadowy creatures stalk on the edge of sight, and Gabby finds herself pursued by unearthly forces. Finally, on the longest night of her life, Gabby is trapped in a powerless subway car - and the only thing standing between her and horrific death-by-monster is some skinny white guy in a suit - who's waving a blue flashlight around! If Gabby survives this - she's going to kill him! 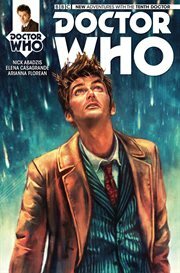 Eisner Award-winning Nick Abadzis (Laika) and fan-favorite Elena Casagrande (Suicide Risk) ramp up the tension, horror, and joy of discovery - as a new companion meets the Tenth Doctor! Plus: every packed issue also includes a 'Titans' strip, and a brand-new humor strip!